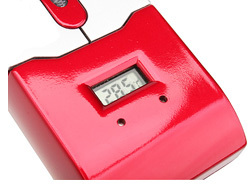 Brando USB Mouse/Laser Pointer/Thermometer | OhGizmo! By Andrew Liszewski on 04/19/06 • Leave a comment! Is it just me, or is the mouse and cellphone on an inevitable collision course of convergence? Both sides seem to be incorporating more and more functionality every day and I think one day both parties will go as far as they can and decide that a mouse/cellphone is the final innovation. For now at least Brando brings us a USB mouse that incorporates a laser pointer as well as a thermometer which displays the current temperature of the room on the mouse’s built-in LCD display. One thing I particularly like is that the mouse is attached to its cord VIA a USB connection. The included cord has a built-in retractor allowing it to be set at a custom length however being attached with a USB connection theoretically means you can use any USB cable if the included one doesn’t suit your needs. This multi-function mouse is now available from Brando for $18.00.